The Republic and Canton of the Jura, also known as the canton of Jura or canton Jura, is the newest of the 26 Swiss cantons, located in the northwestern part of Switzerland. The capital is Delémont. It shares borders with the canton of Basel-Landschaft, the canton of Bern, the canton of Neuchatel, the canton of Solothurn, and the French régions of Bourgogne-Franche-Comté and Grand Est. The canton of Bern or Berne is the second largest of the 26 Swiss cantons by both surface area and population. Located in west-central Switzerland, it borders the canton of Jura and the canton of Solothurn to the north. To the west lie the canton of Neuchâtel, the canton of Fribourg and canton of Vaud. To the south lies the canton of Valais. East of the canton of Bern lie the cantons of Uri, Nidwalden, Obwalden, Lucerne and Aargau. The canton of Basel-Stadt is one of the 26 cantons of Switzerland, and the smallest of the cantons by area. The city of Basel and the municipalities of Bettingen and Riehen form its territory. The canton of Appenzell Innerrhoden is the smallest canton of Switzerland by population and the second smallest by area, with canton of Basel-City being the smallest. It was the last Swiss canton to grant women the right to vote on local issues, in 1991. A canton is a type of administrative division of a country. In general, cantons are relatively small in terms of area and population when compared with other administrative divisions such as counties, departments, or provinces. Internationally, the best-known cantons - and the most politically important - are those of Switzerland. As the constituents of the Swiss Confederation, theoretically, the Swiss cantons are semi-sovereign states. In heraldry, a canton is a charge placed upon a shield. It is typically a square in the upper dexter corner, but may appear elsewhere on the shield. A canton is classed by some heraldic writers as one of the honorable ordinaries; but, strictly speaking, it is a diminutive of the quarter, being two-thirds the area of that ordinary. However, in the armorial roll of Henry III, the quarter appears in several coats which in later rolls are blazoned as cantons. The canton, like the quarter, appears in early arms, and is always shown with straight lines. Waldstätte is the Stätte, or later Ort or Stand of the early confederate allies of Uri, Schwyz and Unterwalden in Central Switzerland. The term Stand (French : état, Italian : stato) remains in synonymous usage and is reflected in the name of the upper chamber of the Swiss Parliament, the Council of States (German : Ständerat, French : Conseil des États, Italian : Consiglio degli Stati, Romansh : Cussegl dals Stadis). 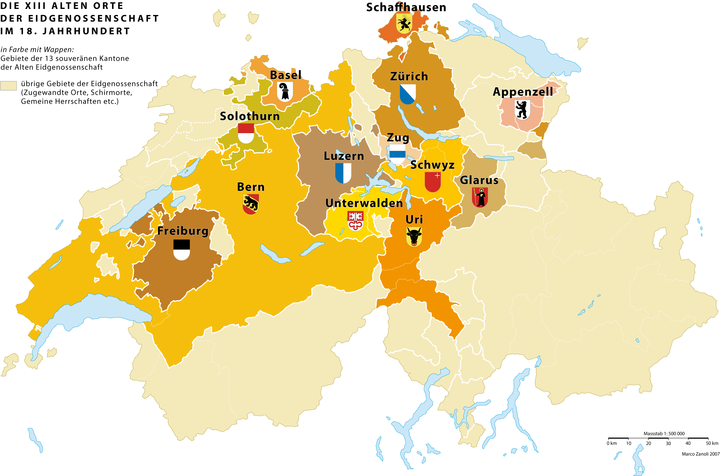 In the 16th century, the Old Swiss Confederacy was composed of 13 sovereign confederate allies (the Thirteen Cantons; German : Die Dreizehn Alten Orte), and there were two different kinds: five rural states (German : Länder) – Uri, Schwyz (which became eponymous of the confederacy), Unterwalden, Glarus, Appenzell – and eight urban states (German : Städte) – Zürich, Bern, Luzern, Zug, Basel, Fribourg, Solothurn, Schaffhausen. The Swiss Federal Constitution  declares the cantons to be sovereign to the extent that their sovereignty is not limited by federal law. Areas specifically reserved to the Confederation are the armed forces, currency, the postal service, telecommunications, immigration into and emigration from the country, granting asylum, conducting foreign relations with sovereign states, civil and criminal law, weights and measures, and customs duties. Each canton has its own constitution, legislature, executive, police and courts. Similar to the Confederation, a directorial system of government is followed by the cantons. Most of the cantons' legislatures are unicameral parliaments, their size varying between 58 and 200 seats. A few legislatures also involve or did involve general popular assemblies known as Landsgemeinden ; the use of this form of legislature has declined: at present it exists only in the cantons of Appenzell Innerrhoden and Glarus. The cantonal executives consist of either five or seven members, depending on the canton. For the names of the institutions, see the list of cantonal executives and list of cantonal legislatures. The two-letter abbreviations for Swiss cantons are widely used, e.g. on car license plates. 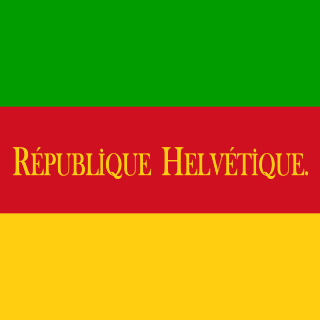 They are also used in the ISO 3166-2 codes of Switzerland with the prefix "CH-" ( Confœderatio Helvetica —Helvetian Confederation— Helvetia having been the ancient Roman name of the region). CH-SZ, for example, is used for the canton of Schwyz. The People and the cantons of Zürich, Bern, Lucerne, Uri, Schwyz, Obwalden and Nidwalden , Glarus, Zug, Fribourg, Solothurn, Basel-Stadt and Basel-Landschaft , Schaffhausen, Appenzell Ausserrhoden and Appenzell Innerrhoden, St. Gallen, Graubünden, Aargau, Thurgau, Ticino, Vaud, Valais, Neuchâtel, Geneva, and Jura form the Swiss Confederation. The historical canton of Appenzell divided itself into "inner" and "outer" halves (Rhoden) as a consequence of the Reformation in Switzerland in 1597:  Appenzell Innerrhoden (Catholic) and Appenzell Ausserrhoden (Protestant). In the 20th century, some Jurassic separatists suggested a new canton of Jura to be divided into half-cantons of North Jura and South Jura. Instead, North Jura became the (full) canton of Jura while South Jura remains in the canton of Bern as the region of Bernese Jura. 1 2 3 4 founding forest-canton, foundation date traditionally given as either 1307, 1304 or 1291 (see Foundation of the Old Swiss Confederacy). ↑ Act of Mediation; formed out of the Canton of Säntis and the northern half of the Canton of Linth. ↑ Act of Mediation; formerly the Canton of Raetia, comprising the earlier Three Leagues. ↑ Act of Mediation; created from the 1798-invented cantons of Aargau (previously land controlled by Bern) and Baden (previously a Swiss condominium), together with Fricktal (before 1802 not Swiss territory). ↑ Act of Mediation; coterminous with the canton of Thurgau of the Helvetic Republic (1798), formerly a condominium. ↑ Act of Mediation; combining the former cantons of Bellinzona and Lugano; see Ennetbirgische Vogteien . ↑ Act of Mediation, formerly Canton of Léman. ↑ claimed by Frederick William III of Prussia until the Neuchâtel Crisis of 1856–1857. ↑ Twenty-three after the creation of the Canton of Jura in 1978. ↑ The most commonly used forms in English are mostly adopted from either French or German; in some cases, there may have been a historical shift in preference, e.g. from the French form Berne to the German form Bern; in individual cases, the Latin form may be current, certainly in the case of Geneva and arguably for Argovia, Thurgovia. Actual anglicized forms have been used, for example Basle . Romandy is the French-speaking part of western Switzerland. In 2018, about 2.1 million people, or 25.1% of the Swiss population, lived in Romandy. The bulk of the romand population lives in the Arc Lémanique region along Lake Geneva, connecting Geneva, Vaud and the Lower Valais. Albula District was one of the eleven administrative districts in the canton of Graubünden in Switzerland. It had an area of 723.13 km² and had a population of 8,210 in 2015. It was replaced with the Albula Region on 1 January 2017 as part of a reorganization of the Canton. Bernina District is a former administrative district in the canton of Graubünden, Switzerland. It had an area of 237.2 km² and a population of 4,619 in 2015. It was replaced with the Bernina Region on 1 January 2017 as part of a reorganization of the Canton. Prättigau/Davos District is a former administrative district in the canton of Graubünden, Switzerland. It had an area of 823.95 km2 (318.13 sq mi) and has a population of 26,257 in 2015. 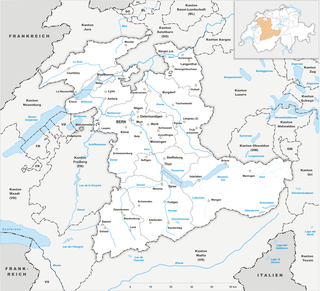 It was replaced with the Prättigau/Davos Region on 1 January 2017 as part of a reorganization of the Canton. Hinterrhein District is a former administrative district in the canton of Graubünden, Switzerland. 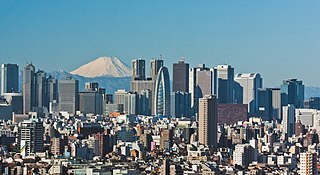 It had an area of 617.67 km2 (238.48 sq mi) and had a population of 13,179 in 2015. Much of the district became part of the Viamala Region on 1 January 2017 as part of a reorganization of the Canton. Moesa District, often referred to as Moesano, is a former administrative district in the canton of Graubünden, Switzerland. It had an area of 473.74 km2 (182.91 sq mi) corresponding to the Val Mesolcina, the valley of the eponymous Moesa River. It was replaced with the Moesa Region on 1 January 2017 as part of a reorganization of the Canton. Münchwilen District is one of the five districts of the canton of Thurgau, Switzerland. It has a population of 46,800. Its capital is the town of Münchwilen. Arbon District is one of the five districts of the canton of Thurgau in Switzerland. It has a population of 56,229 .Its capital is the town of Arbon. Diessenhofen District is a former district of the canton of Thurgau in Switzerland. It had a population of 6,621. Its capital was the town of Diessenhofen. Steckborn District is a former district of the canton of Thurgau, Switzerland. It had a population of 18,215. Its capital was the town of Steckborn. Kreuzlingen District is one of the five districts of the canton of Thurgau in Switzerland. It has a population of 47,823. Its capital is the city of Kreuzlingen. Weinfelden District is one of the five districts of the canton of Thurgau, Switzerland. It has a population of 55,242. Its capital is the town of Weinfelden. Bischofszell District is a former district of the canton of Thurgau in Switzerland. It had a population of 31,773. Its capital was the town of Bischofszell. There are 162 municipalities in the Canton of Zürich in Switzerland. Albula Region is one of the eleven administrative districts in the canton of Graubünden in Switzerland. It had an area of 683.51 square kilometers (263.90 sq mi) and a population of 8,102 .. It was created on 1 January 2017 as part of a reorganization of the Canton. Bernina Region is one of the eleven administrative districts in the canton of Graubünden in Switzerland. It had an area of 237.31 square kilometers (91.63 sq mi) and a population of 4,651 .. It was created on 1 January 2017 as part of a reorganization of the Canton. Maloja Region is one of the eleven administrative districts in the canton of Graubünden in Switzerland. It had an area of 973.65 square kilometers (375.93 sq mi) and a population of 18,401 .. It was created on 1 January 2017 as part of a reorganization of the Canton. Surselva Region is one of the eleven administrative districts in the canton of Graubünden in Switzerland. It had an area of 1,373.56 square kilometers (530.33 sq mi) and a population of 21,420 .. It was created on 1 January 2017 as part of a reorganization of the Canton. Viamala Region is one of the eleven administrative districts in the canton of Graubünden in Switzerland. It had an area of 627.58 square kilometers (242.31 sq mi) and a population of 13,538 .. It was created on 1 January 2017 as part of a reorganization of the Canton. ↑ rendered "the 'confederacy of eight'" and "the 'Thirteen-Canton Confederation'", respectively, in: "Chronology" (official site). Berne, Switzerland: The Swiss Federal Administration. Retrieved 2018-06-24. 1 2 3 4 5 Andreas Kley:Kantone in German , French and Italian in the online Historical Dictionary of Switzerland ,2016-04-13. "Die Bündnispartner der frühen Eidgenossenschaft wurden im 14. Jh. meist als Städte und Länder, ab der 1. Hälfte des 15. Jh. immer mehr als Orte bezeichnet." ↑ François Schifferdecker, François Kohler:Jura (canton) in German , French and Italian in the online Historical Dictionary of Switzerland ,2015-07-20. ↑ Comptes Trés. 129, Archives nat. ds Pat. Suisse rom., cited after TFLi. ↑ "So werden die Cantons der Schweizer daselbst nur Orte, oder Ortschaften genannt. Das gleichbedeutende Canton stammet auf ähnliche Art von Kante, Ecke, ab, wie Ort von Ort, Ecke." Johann Christoph Adelung, Grammatisch-kritisches Wörterbuch der Hochdeutschen Mundart (1774–1786), s.v. "Der Ort". Old French canton "corner, angle" is a loan from Occitan, first recorded in the 13th century, in Occitan adopted from North Italian cantone, where the sense "portion of territory" alongside "edge, corner" developed from by the early 11th century (TFLi). ↑ etymonline.com: "1530s, 'corner, angle,' [...] From 1570s as a term in heraldry and flag descriptions. From c. 1600 as 'a subdivision of a country;' applied to the sovereign states of the Swiss republic from 1610s." ↑ Josef Wiget:Waldstätte in German , French and Italian in the online Historical Dictionary of Switzerland ,2014-12-27. ↑ Constitution du Canton du Valais: "Le Valais est une république démocratique, souveraine […] incorporée comme Canton à la Confédération suisse." ↑ Constitution du canton de Vaud: "Le Canton de Vaud est une république démocratique [… qui] est l'un des États de la Confédération suisse." ↑ "Costituzione della Repubblica e Cantone del Ticino, del 4 luglio 1830" (in Italian). Swiss Federal Council. Le canton du Tessin est une république démocratique [… qui] est membre de la Confédération suisse et sa souveraineté n'est limitée que par la constitution fédérale." ↑ "Switzerland". Encyclopædia Britannica. 26. 1911. p. 251. Retrieved 11 November 2008. 1 2 Cantons, In the Federal State since 1848 in German , French and Italian in the online Historical Dictionary of Switzerland . ↑ "Regional Portraits: Cantons". Neuchâtel, Switzerland: Swiss Federal Statistical Office. 2011. Archived from the original on 30 April 2009. Retrieved 21 December 2015. ↑ Cantonal coats of arms shown with cantonal heraldic colors (Standesfarben). Standesfarben were used to identify the (historical) cantons when the full banner was not available for display, although there is overlap; Unterwalden and Solothurn share the same colours, as do Basel and Appenzell, and with the accession of the modern cantons, Valais and Basel-City, and St. Gallen and Thurgau. Louis, Mühlemann, Wappen und Fahnen der Schweiz, 700 Jahre Confoederatio Helvetica, Lengnau, 3rd ed. 1991. Swiss Armed Forces, Fahnenreglement, Reglement 51.340 d (2007). ↑ Office, Federal Statistical. "Cantonal gross domestic product (GDP) per capita". www.bfs.admin.ch. Retrieved 2017-08-22. ↑ Swiss Federal Statistical Office. "Gemeinden - Suche | Applikation der Schweizer Gemeinden". www.agvchapp.bfs.admin.ch (in German). Retrieved 22 October 2018. ↑ "STAT-TAB – Ständige und nichtständige Wohnbevölkerung nach institutionellen Gliederungen, Geburtsort und Staatsangehörigkeit" (online database) (official site) (in German and French). Neuchâtel, Switzerland: Federal Statistical Office - FSO. Retrieved 17 September 2018. ↑ Bundesverfassung der Schweizerischen Eidgenossenschaft vom 29. Mai 1874, Bundesverfassung der Schweizerischen Eidgenossenschaft vom 12. September 1848 (in German); author's translation. ↑ Felix Hafner / Rainer J. Schweizer in Ehrenzeller, Art. 1 N 2; Häfelin, N 966. ↑ Pacte fédéral du 1er Archived 30 August 2009 at the Wayback Machine août 1291] sur Admin.ch "vallée inférieure d'Unterwald" signifie Nidwald. ↑ Bassand, Michel (1975). "The Jura Problem". Journal of Peace Research. Sage Publications. 12 (2: Peace Research in Switzerland): 139–150: 142. doi:10.1177/002234337501200206. JSTOR 423158. (Subscription required (help)). ↑ Renz, Fabian (2010-06-11). "SVP will der Schweiz Nachbargebiete einverleiben". Tages-Anzeiger . Retrieved 2017-07-11. 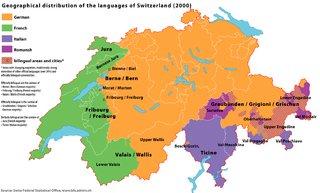 Wikimedia Commons has media related to Cantons of Switzerland . Wikisource has the text of a 1911 Encyclopædia Britannica article about The History of Switzerland .